+ LuxRender is a open source physically correct, unbiased rendering engine developed on the basis of PBRT; an outstanding research project and book by Matt Pharr and Greg Humphreys. LuxRender is totaly Physically Based Render; which means, unlike other popular 3D rendering systems, LuxRender doesn't use tricks to imitate real world behavior : all calculations are done according mathematical models based on the real word. Physically based Unbiased rendering engines offers advantage of very realistic images but at the cost of time; slow due to heavy calculations. Rendering with LuxRender means simulating light according to physical equations, this produces realistic photographic quality images. LuxRender comprises an interactive GUI, a command line tool, and Blender 3D exporter Plugins (LuxBlend). The Lux Source code is also available freely to developer for future integration of LuxRender into third-party applications. 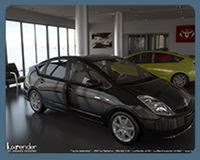 LuxRender runs on GNU/Linux, Microsoft's-Windows(R) and MacOS X(R) platforms. - Physically based Lightsources: area, sunsky, infinite, distant, spot, goniometric , projection etc. - Materials & Textures: Inculdes BRDFs, PBRT, Image textures, HDRI, Procedural Textures etc. - Film/Texture Imaging Pipeline : Colour handling, OpenEXR RGBA, Tonemapping, filters, Pixel Sample Reconstruction Filters, Gamma correction etc. - Path Tracing, Bidirectional Path Tracing, final gathering, Instant "Global Illumination"
....these are only some of the features in luxRender, a full features list is available on their website. Interested 3d user can freely download both LuxRender and LuxBlend - Blender 3D exporter Plugins. Blender 2.4 + LuxRender tutorials are also available along with a reference manual.